Coming on the heels of Facebook’s $1 billion Instagram acquisition, but otherwise pretty much out of nowhere, the social networking giant just released a brand new Camera app called Facebook Camera… and it’s so much like Instagram that you have to wonder if Facebook bought the up-and-coming app just so it could put a bullet through its head before it became a real threat. Earlier today, the Space Shuttle Discovery took its final flight on the back of a modified Boeing 747 jumbo jet from the Kennedy Space Center in Florida to Washington, D.C. where it will go on display in the Smithsonian. 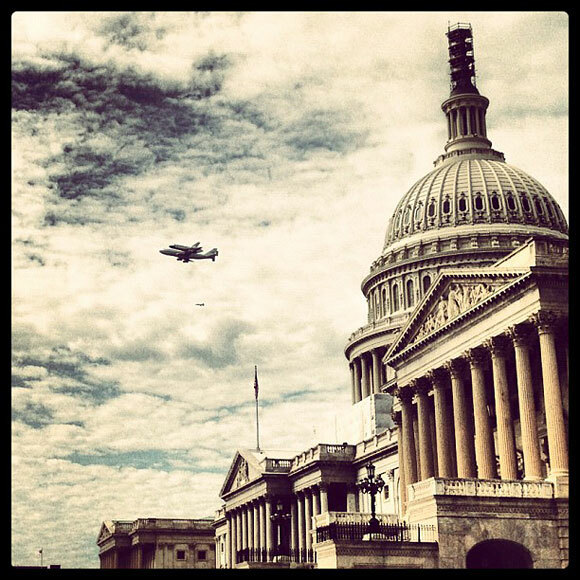 As it flew over the U.S. capitol, Instagram user Adam Wells took this totally sweet shot of the Discovery being piggy-backed to her final home at the Smithsonian’s Air & Space facility in Chantilly, Virginia. Beautiful.